← I Got Rhythm, I Got Music…Who Could Ask For Anything More? Well, the good news is…I’ve discovered that I could never make hoarding a way of life. How did I arrive at this moment of clarity? Pretty easy. I’m living like one now. It’s not the result of an inability to say NO to a garage sale, a President’s Day, Labor Day or Memorial Day mattress sale or the Black Friday allure of saving gobs of money by spending lots of it. I have never been a shopper. I hate shopping. The only way I can be bribed into a day of shopping is if lunch is part of the deal. Even at the grocery store, if my cart is filled to, what I consider maximum capacity, I am absolutely impervious to any marketing blitz with which the store may bombard me. It doesn’t matter if it’s a great deal for the ONE thing I came to the store to purchase (which, of course, is the only item NOT in my cart). I have been known to pass right by the toilet paper, even if we’re down to sharing squares in the house. So…no…over-buying is not my problem. My problem is that we are in the midst of a home renovation. It started out as a simple job. We were only planning to open up a couple of entryways. But that led to filling in wood flooring where parts of the walls were removed, which led to repairing said remaining walls and sanding, staining and polyurethaning two entire rooms of wood floors because of a couple repair areas, causing a dangerous amount of fumes to be inhaled by my husband, myself and my dog, who has NO IDEA what the heck has happened to his world. 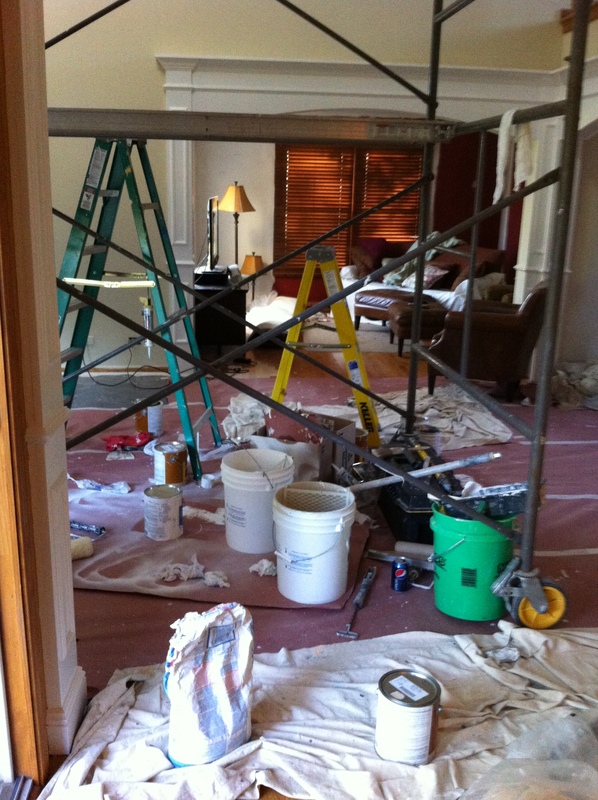 Oh, we’re also painting the entire first floor – walls and woodwork, doors and windows. Pictured above are just a couple of photos of the chaos in which I find myself surrounded. As a result, there is no rhyme or reason to my house anymore. Furniture has been relocated into EVERY OTHER ROOM in the house. The epiphany of my decline into hoarder-dom happened last night, as I was attempting to navigate my way through the kitchen, into the dining room and finally upstairs to retire for the evening. I found myself feeling my way through the dark, taking extra large steps to avoid stepping on any miscellaneous bits of stuff in the way and practically climbing over furniture. My husband did make sure there was an escape route in the event of a crisis during the night, still requiring us to be extremely nimble to reach safety or for rescuers to find us in the event we failed. 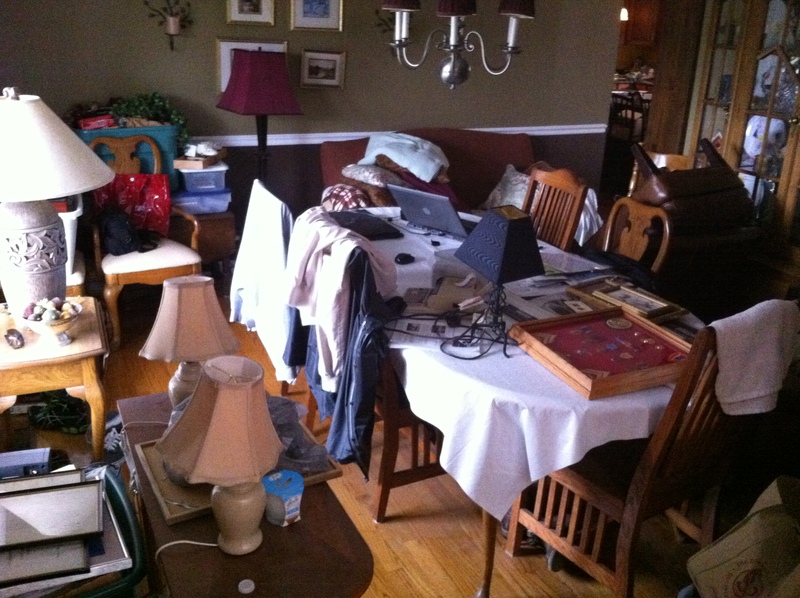 Fortunately, no disaster befell us during our slumber, but I awoke this morning thinking that if this project is not completed in the very near future, I might contact the producers of HOARDERS to see if my house might qualify for a sympathetic episode. On second thought, that’s probably just the fumes talking.